We develop and use remote sensing techniques to improve understanding of the Earth. ISciences develops and uses remote sensing techniques to improve understanding of the Earth. We develop models of optical properties, algorithms for extracting information from remotely sensed data, and conduct studies to solve specific user problems. In response to an article by Lester Brown titled “Who Will Feed China?” that argued China had insufficient agricultural land to feed its population, ISciences undertook a study of China’s arable land using multi-resolution satellite data. We developed a novel multi-stage sampling technique that allowed high-confidence assessment of all of China. The results of this study, which showed that China had significantly more arable land than was publicly reported, altered the entire dialog on this subject. The multi-stage sampling technique is embedded in a commercial remote sensing software package. 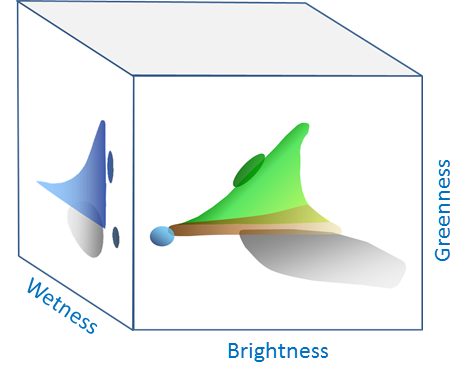 ISciences developed a physics-based model for accurately predicting the polarimetric Bi-directional Reflectance Distribution Function (BRDF) for arbitrary wavelength and source /sensor geometry, using a limited number of BRDF measurements to characterize the material of interest. Use of this model allows correction of collected data for the effects of illumination or view angle. This is particularly useful if an overhead sensor is not looking straight down, such is often the case with wide-swath or aircraft-based sensors. The model supports collection planning and optimization, allowing assessment of the optimal time and geometry for collecting data to maximize detectability or identification. ISciences develops methods for reducing complex multi- or hyper-spectral datasets through invariant subspace transformations. These transformations reduce the dimensionality of the data, placing the data in a context that both has physical relatability and is independent of the specifics of the scene content. Examples include the Tasselled Cap transform - created for Landsat Thematic Mapper data by Ric Cicone (et al), now part of ISciences' team - that separates vegetation, soil, and water characteristics of the scene, and the Thermal Spiral which helps separate temperature and emissivity effects in Long-Wave Infrared (LWIR) data.